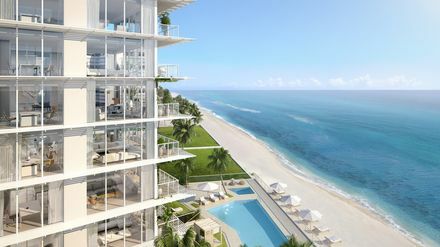 Discover 3550 South Ocean, a contemporary masterpiece right at the edge of the ocean in legendary Palm Beach, Florida. This exceptional concierge building offers glorious water views and a range of desirable services tailored to your requirements. The perfect orientation along the ocean captures the tropical beauty of the environment. 3550 South Ocean is now under construction with move-in ready residences scheduled for occupancy in early 2019. Step into the spacious two and three bedroom layouts and appreciate every amenity you need for the upscale Palm Beach lifestyle. Find a sophisticated color palette of neutral tones and contemporary lines that are softened with natural materials like limestone and wood. 30 distinctive residences offer 2,700 to over 3,000 square feet of luxurious sun-drenched living space. The stylish interiors feature modern design by the renowned Champalimaud interior design firm. Dramatic floor-to-ceiling sliding glass doors provide amazing views of the blue Atlantic, the scenic Intracoastal Waterway and landscapes of affluent Palm Beach. Enjoy indoor/outdoor living on your own private balcony overlooking the ocean, the ideal spot for savoring cooling ocean breezes at the end of the day. For the ultimate in luxury, choose one of the five penthouse apartments, each with its own private rooftop terrace and plunge pool. From striking architectural design to desirable upscale amenities and top-of-the-line finishes, 3550 South Ocean has it all. Find special touches like impressive entry foyers and galleries, multiple bedrooms with ensuite baths, and gourmet kitchens integrated with the open concept great room. Italian inspired kitchen designs feature showcase solid stone islands. 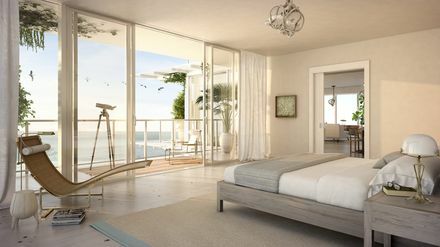 The master bedrooms are a quiet oasis featuring oversized dressing rooms and expansive oceanside balconies. Private spa-like baths are designed with stone or wood accent walls, travertine and limestone. Take advantage of the sparkling beachfront swimming pool just steps away from the ocean. The onsite fitness studio is a light-filled space with glass walls and white oak floors. Keep up with your fitness regimen with advanced Technogym equipment. Store your kayak and paddleboard near the beach, and enjoy the convenience of private onsite parking. 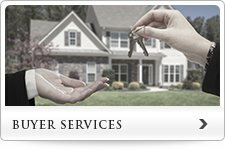 The full-time concierge staff will cater to your every need. As a resident of 3550 South Ocean you will join the exclusive enclave of Palm Beach, the storied town known the world over along Florida's exclusive Gold Coast. What began as a Gilded Age retreat for industrialist Henry Flagler of Standard Oil fame is now a sought-after destination known for glamor and beauty. From fine dining and world-class shopping on Worth Avenue to the lavish events of the winter season, you will be part of the Palm Beach scene. Delight in the refined atmosphere and timeless elegance of lovely homes with manicured lawns, impressive towering palm trees and colorful tropical blooms all year around. 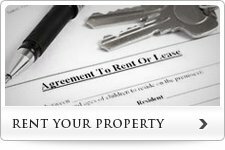 Experience all that the Palm Beach area has to offer. Visit the Palm Beach International Equestrian Center and the International Polo Club Palm Beach for exciting equestrian exhibitions. Reserve season tickets at the Raymond F. Kravis Center for the Performing Arts in West Palm Beach, a premier performance venue featuring a roster of acclaimed artists from every discipline from comedians and musical performances to ballet. Learn about the origins of Palm Beach at the Flagler Museum, the former home of Henry Flagler. Outdoor amphitheaters, Lion Country Safari and the Loxahatchee Everglades Tour are perfect for family fun. 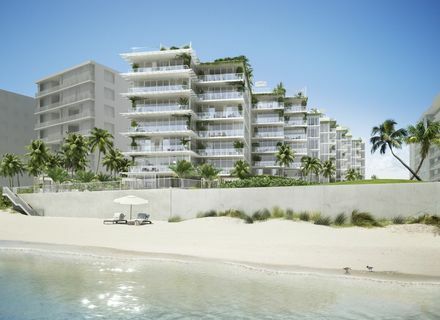 For further information about the new luxury 3550 South Ocean building in Palm Beach, please contact Douglas Elliman Broker Associate Francis Hoet at 561-729-8518, or email at francishoet@wellingtonproperties.com. 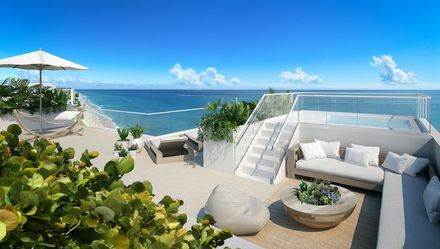 Visit the website at https://www.wellingtonproperties.com/palm-beach-condos/3550-south-ocean.htm to find out about other premiere properties. Discover a lovely estate home offered for rent or sale in the desirable Saddle Trail neighborhood of Wellington, an equestrian paradise. Find all the amenities you expect along with some delightful surprises like the Palm Beach International Equestrian Center right nearby. Gourmet restaurants, shopping, a wide array of entertainment options and world-class equestrian events make Wellington in Palm Beach County the perfect spot for your winter getaway. This exceptional estate home is tucked away on a quiet street in the equestrian community of Saddle Trail. The upscale 5-bedroom pool home features a convenient bedroom and ensuite bath on the ground level. A terrace overlooking neighboring farms and barns is designed for all year around outdoor living in pleasant Florida weather. Find everything you need onsite for the relaxed equestrian lifestyle, including a 6-stall barn with an air-conditioned tack room a feed room and three large grassy paddocks. The Washington Post dubbed Wellington the “Equestrian Capital of the World,” and Money magazine named the town among the top 100 places to live in the nation. Wellington’s Saddle Trail neighborhood provides 57 glorious miles of bridle paths that wind through the community for your enjoyment. The world-class Palm Beach International Equestrian Center is within hacking distance where you can view elite riders and Olympic equestrians from across the globe who come here to compete. Spend quality time among residents with similar interests at Saddle Trail, conveniently located near Forest Hills Boulevard and US Route 441 near West Palm Beach. The Palm Beach International Equestrian Center is a 160-acre destination facility dedicated to the equestrian lifestyle. It is considered a top venue with 12 competition rings of Olympic quality suitable for dressage, jumping, hunter, polo, western/trail riding and driving. In addition to dressage competitions, the Palm Beach International Equestrian Center presents exciting jumper derbies and horse exhibitions along with equestrian clinics. The popular 12-week Winter Equestrian Festival will take place at the Equestrian Center starting in January, 2019. Saturday Night Lights is a family event with equestrian show jumping, casual and fine dining options, shopping, a live band and a children’s fair. For your convenience, box and VIP seating is available. The International Polo Club Palm Beach in Wellington is a premier polo destination. Polo matches are open to the public. Enthusiasts can take advantage of elegant grandstand and stadium seating along with an elegant champagne brunch field side. Polo matches are held every Sunday during the winter season on Championship Field. The main stadium at the International Polo Club can accommodate over 1,600 spectators, a testament to the popularity of the sport. Friendly Saddle Trail provides opportunities to view and participate in local equestrian events and shows. The Winter Equestrian Festival and draws thousands of visitors including celebrities like Bill Gates, famous athletes and well-known musicians. 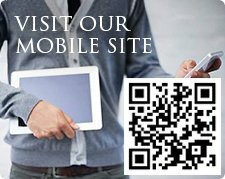 Find jumper, hunter and spectacular dressage events at the Palm Beach International Equestrian Center and other venues including the Mark Wonderly Hunter Jumper Shows and Wellington Classic Dressage. Beautiful Wellington offers a world of exciting activities right at your fingertips. The Wellington Amphitheater is a state-of-the-art, 3,200 square foot outdoor venue with a calendar of events for adults and children. Visit the designer shops, gourmet restaurants and high end shopping of Palm Beach, just 45 minutes away. The Raymond F. Kravis Center for the Performing Arts in West Palm Beach is a premier facility featuring acclaimed artists from every discipline, from opera and ballet to comedians. Family activities include the Calypso Bay Water Park, Lion Country Safari and the Loxahatchee Everglades Tour. 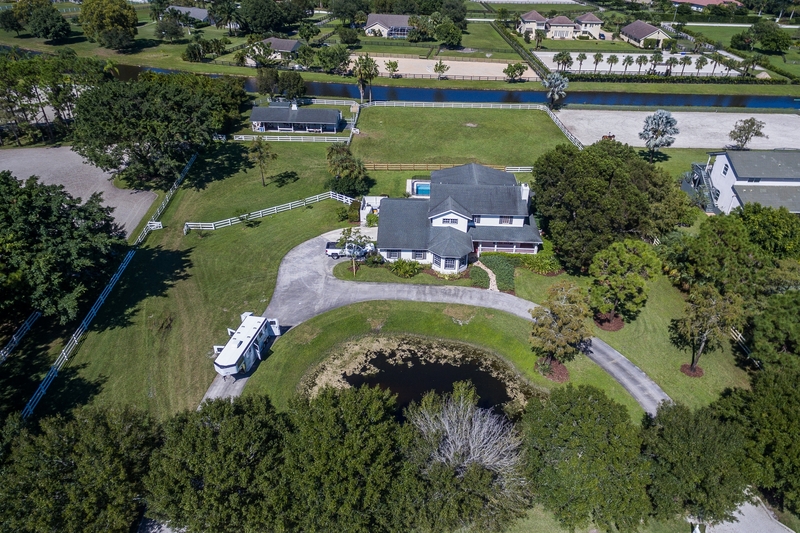 For further information about this outstanding Saddle Trail equestrian home in an exceptional Wellington, FL location, please contact Francis Hoet, a Douglas Elliman Broker Associate, at 561-729-8518, or email at francishoet@wellingtonproperties.com. 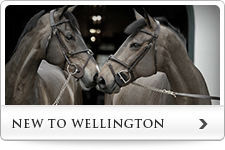 Visit the website at wellingtonproperties.com to see other equestrian properties. Tags: Elliman Q4 Report 2017! Check out the latest Elliman report for the Wellington 4Q 2017 real estate market! 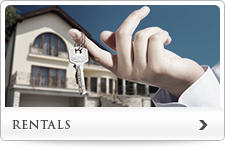 PDF FileCheck out the latest Elliman report for the Wellington real estate market! Check out the latest Wellington ELLIMAN Q4 2016 real estate report! The New Year is upon us, and with that comes the excitement of the 2017 Equestrian Show Season! Wellington is known as the equestrian capital of the world. Only one week into the season, and we’ve already seen the Equestrian Sport Productions Holiday Finale kick off! Only a day into competition the first winners of 2017 have been crowned, from Mara Picciochi taking first place aboard Quixotic Z in the Puddle Jumpers, Daniel Coyle with Farona claiming the top spot in the 1.30m, and Maria Rasmussen was head of the leaderboard in Performance Hunter 3ft3 on Rendezvous Farm’s - Prologue. With the fun from the first show already getting us in horse show mode, we decided that there would be no better way to welcome the season than by taking a look ahead to some of the most exciting events happening in 2017! The Winter Equestrian Festival will be kicking off once again in 2017! Starting on the 11th of January and running until the 2nd of April, we’ll see riders from more than thirty-three countries fight for their chance for the top prize, and a share of the generous prize fund - which currently stands at just over $9 million! While the pros might have us all clambering for a seat to watch the big prize money classes, there’s no worry of forgetting the amateurs and pony riders! As one of the most competitive arenas in the world; the quality of horses and expertise of riders in every division is a remarkable sight to behold. One of the biggest crowd pleasers has to be The Battle of The Sexes! On the 14th of January, the girls will go up against the guys to compete for charity in a series of match races, and speed classes. With the girls having won every Battle Of The Sexes since the competition's inception nine years ago, we wonder whether the girls can hold on for a full decade, or whether the boys will step up their game! The Global Dressage Festival has long been known as one of the most esteemed dressage competitions on the circuit. Taking place at Adequan Global Dressage between the 12th of January and the 25th of March 2017. The show organizers are well known for their ability to put on a great competition that has riders coming back year after year, and with crowd favorites including the CDI 5* and CPEDI 3*, we expect to welcome some big names to our small corner of the world. The oldest event on our list is the US Open Polo Championships, this event was first held over one hundred years ago in Van Cortlandt Park, NY but has since migrated to the warmer climes of Florida. The show has a lot of anticipation this year due to recent developments in the Polo scene here in Wellington. Currently going through some significant changes, Wellington Polo aficionados will likely know of the recent sale of the International Polo Club to Wellington Equestrian Partners (WEP). With an extensive list of competitions, circuits, and venues already under the successful ownership of WEP, we see their partnership with the Polo world signaling a bright future for the local Polo scene. Don't miss the battles at Gladiator Polo January 26th! 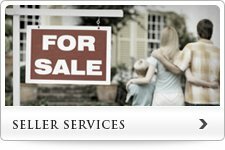 Overall price trend indicators for the Palm Beach housing market continued to rise. Check out the 2Q Elliman report 2016! If you’re familiar with the Palm Beach International Equestrian Center then you are already aware that their facilities are world class. So to keep up with ever higher expectations from a demanding public they have undertaken major renovations, as they explain in their most recent press release from September 27th. The International Ring, as well as the warm-up areas right beside it are getting an improved drainage system and arena base as well as a complete install of the newest technology in footing material in order to enhance the stability and quality of competition at the facility. In order to provide everyone there with what could arguably be described as one of the finest surfaces in the world, Equestrian Services International, the industry’s leading footing and Surface experts, are engineering all the renovations for the International Ring, which will include freshly mixed all-weather footing. Although at the top of the list of priorities we can find the International Ring and surrounding areas, improvements in footing and arena base to the Mogavero Ring and the Denemethy Ring are also scheduled. ESI will handle all of them so that they are ready by the beginning of the Winter Season. This just goes to show that the best are the best because they keep getting better.